Would you like to have the confidence, the kind of driving purpose, that shuts out all fear? Do you want your life to be filled with adventure? There are many kinds of soldiers, and the ones that this book is written for don't necessarily wear a uniform. The missions these soldiers undertake have more than just political or historical significance-they are impacting eternity. Bulletproof is a field manual for the Christian soldier. It addresses the issues of fear and risk from a Christian perspective, using primarily military examples and analogies. Holton teaches believers how to overcome fear and join the ranks of the army of God. Terrorism. Murder. Disease. Job Loss. Road Rage. Weapons of Mass Destruction. Environmental Disaster. By every sense of reason, you should be. By faith, you don't have to be. God's soldiers are issued body armor: Peace that surpasses understanding. But you must choose to put it on. Chuck Holton reveals how to claim this peace of mind and rest in the sovereignty of God's plan while stationed in our dangerous world. Not denying legitimate causes for fear, Holton's balanced perspective to living boldly as a Christian today offers refreshing hope in the midst of rampant anxiety. Because when you begin seeing things from the Commander's perspective, you won't have to dodge bullets. Until your mission is complete, you are bulletproof. Would you like to have the confidence, the kind of driving purpose, that shuts out all fear? Do you want your life to be filled with adventure? There are many kinds of soldiers, and the ones that this book is written for don’t necessarily wear a uniform. The missions these soldiers undertake have more than just political or historical significance—they are impacting eternity. 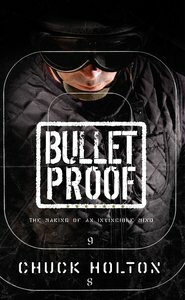 Bulletproof is a field manual for the Christian soldier. It addresses the issues of fear and risk from a Christian perspective, using primarily military examples and analogies. Holton teaches believers how to overcome fear and join the ranks of the army of God. By every sense of reason, you should be. By faith, you don’t have to be. God’s soldiers are issued body armor: Peace that surpasses understanding. But you must choose to put it on. Chuck Holton reveals how to claim this peace of mind and rest in the sovereignty of God’s plan while stationed in our dangerous world. Not denying legitimate causes for fear, Holton’s balanced perspective to living boldly as a Christian today offers refreshing hope in the midst of rampant anxiety. Because when you begin seeing things from the Commander’s perspective, you won’t have to dodge bullets. I love this author!! This is SUCH a good book on trusting God, no matter what. As the mother of three adventurous boys, I needed to hear God speaking to me through a book such as this, in order to let my boys be boys. The book is very well written, and details many interesting life experiences of the author throughout. I would recommend it to anyone who wants to have the confidence to step out and totally trust God in all things.